Easy to plug into earth with the solid stake of solar string lights, or mounted to a wall using the expansion bolts.No additional power is required, 220 LED string lights add a charming atmosphererrounding environment.It is perfect for decorating and lighting in your garden, courtyard, patio, lawn, corridor, fence, windows or outdoor celebration decoration, such as Xmas, wedding, camp, party, festival, etc. rechargeable 18650 li-ion battery,therefore,it can last pretty much all night for decorating and lighting even if it's not sunny during the day. 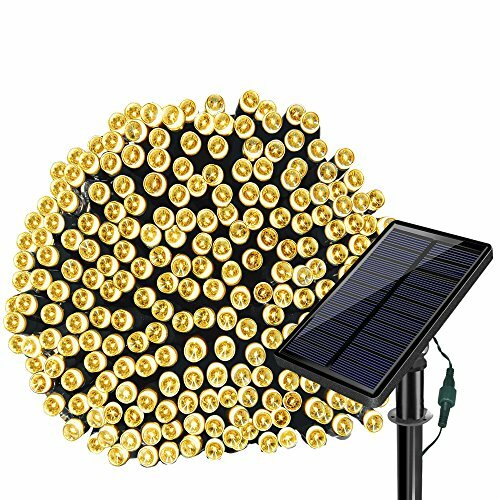 This Solar string light has IP55 class waterproof, so don't worry about using it on rainy days, this outdoor string light is definitely optimal decorating solution for outdoor areas such as garden ,patio , balcony, Christmas tree ,etc. This outdoor string lights will illuminates more than 12 hours at night and gives out bright and charming colorful light once the solar panel absorbs enough sunlight during the day. After charging during the day for 6-8 hours, the 3.7V 2200mAh batteries will provide sufficient power for decorating your gardens, courtyard ,patio, lawn, porch, windows, gates at night. Tips : Any defective products with Solarmks, please contact us first. 12 months worry-free replacement,2 months refund guarantee! 8 WORKING MODELS - ThIS warm white LED string lights with 8 different working modes, and shows fairy lighting & romantic lighting effect.220 led string creates a joyful warm and festive ambience to delight your Christmas, ideal for decorating your gardens, lawn, windows , Xmas tree etc. If you have any questions about this product by SOLARMKS, contact us by completing and submitting the form below. If you are looking for a specif part number, please include it with your message.